Invincible Promotions brings the latest in the Immortality series with Immortality 4: Resurrection card. Main eventing the card will be Steve McKinnon versus Ben Edwards. Steve McKinnon nicknamed the Smashing Machine. Big Ben Edwards was last seen at the K-1 grand Prix event in Seoul, Korea where he was knocked out by Allistair Overeem by a right overhand punch. Steve McKinnon recently defended his super cruiserweight title against Brazil’s Eduardo Maiorino de Morais who has fought in 2 different weight categories in WBC Muay Thai contests. McKinnon has also been busy participating in the EnFusion kickboxing reality Tv show’s 3rd season, which focuses on 95 kg fighters. 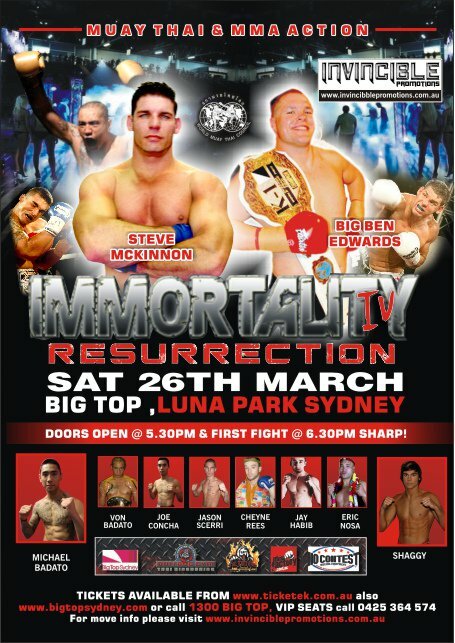 Also notable on the card Michael Badato will be facing “Shaggy” Shannon King presumably at 75 kg. King is a past A-1 champion. While Badato himself has been a champion for WKBF. The remainder of the card has yet to be finalized but tickets should be available via Ticket Tek’s official site.